Riding high on the global success of their collaboration with Bruno Martini and Joy Corporation for ‘Gone Too Long’, brotherly duo Cat Dealers return to the studio alongside budding producer Flakkë, to deliver a track destined for 2019’s festival season. 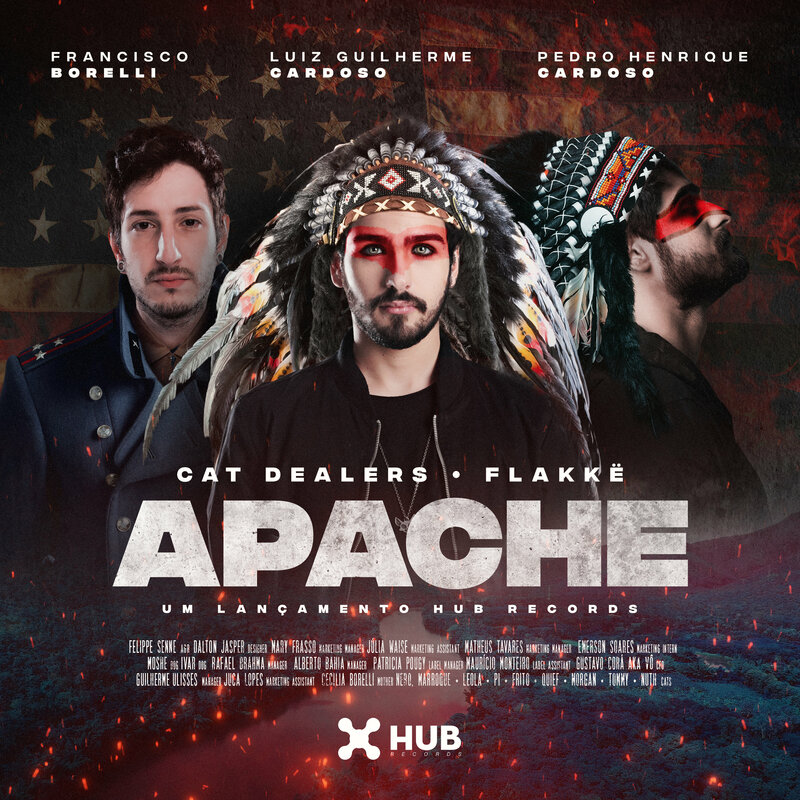 ‘Apache’ is available now via HUB Records across all streaming platforms. ‘Apache’ has all the hallmarks of a Bigroom festival anthem, delivering ample energy and drive that only further proves its worth for the Mainstage. As the title suggests, the track boasts a catchy, tribal influenced vocal line that chants in rounds before rising to a synth heavy drop. Oozing with authentic style, Cat Dealers and Flakkë implement a soft pan-flute and marching percussion in the break, before re-establishing their core synth. 2018 proved instrumental to the global profile of Cat Dealers, as the brothers continued to push out a plethora of electronic music, adding hit after hit to their back catalogue and reaffirming their position as one of Brazil’s hottest dance music exports. Having only been on the scene for 3 years, Cat Dealers have already hit major milestones in their career, opening for Shakira during her latest Brazil tour as well as for Camila Cabelo on Z Festival’s Mainstage. Last month, the duo celebrated their track ‘Sunshine’ reaching Gold Record status, as the collaboration alongside LOthief and Santti amassed over 120 million streams in their native country. The duo were selected for Forbes Brazil’s prestigious ’30 Under 30’ list for their outstanding contribution and influence to the music industry, following the news of their 48th place in last years’ DJ Mag Top 100. No strangers to the international circuit, the brothers are now gearing up for more globetrotting adventures as they prepare for shows across China and Japan before heading to Bangkok’s S2O Music Festival. Having recently signed with the distinguished Paramount Artists, Cat Dealers are expected to grace stages at some of the most esteemed European festivals this summer. With many more highly anticipated productions in the works, Cat Dealers are set to have their most successful year to date, both in the studio and behind the decks.